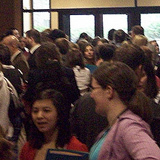 2009 Convention: Students on their way to a session (above). Students performing a skit. (below). Approximately 800 members of English honor societies gather at the Hyatt Regency St. Louis Riverfront to celebrate culture, language, literature, service, and writing. Celebrate St. Patrick’s Day! Registration desk open from 3:00 – 8:00 p.m. Wear your school T-shirt, share your school spirit, and meet others at Wednesday evening’s Opening Ceremony at 7:00 p.m. featuring a high school marching band! Listen to our NEHS featured speaker, Li-young Lee at 7:30 p.m. Applaud members as they read works published in The Rectangle at 8:30 p.m.
Get your groove on at the first Sigma Tau Delta dance party hosted by the student leadership! Snacks will be served. Bring your own beverage at 10:00 p.m. Learn from ΣΤΔ’s most successful chapters! The Student Representatives and Student Advisors are sponsoring Mastering Your Narrative: Stories of Leadership & Service on Thursday morning. The workshop features two breakout sessions on chapter management, student leadership, fundraising, publications, and service. Go to a presentation and book signing by our featured speaker, Chris Abani, at 8:00 p.m. Participate in an Intellectual Freedom Read Out. Enjoy our featured speaker, Azar Nafisi, at 8:00 p.m.
Tell your story at Open Microphone night. Attend a presentation and book signing by our featured speaker, Judith Ortiz Cofer, at 11:00 a.m. Enjoy food and music at the Red & Black Gala Celebration at 6:30 p.m. 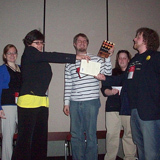 Celebrate excellence at the Awards & Scholarships Presentation & Closing Ceremony at 8:00 p.m. If you decide to stay in St. Louis for an extra day, many tour options are available. Additional details will be posted as the convention date approaches. Tour Examples: Eugene Field (The Children’s Poet) House & Toy Museum; St. Louis Art Museum; Riverboat Tour; Historic Old Courthouse Tour.